EGO is leading the way in cordless battery powered power equipment. Not only is it top rated in online buying guides and reviews, but it’s also renowned for its innovation and belief that battery powered products are our future. EGO chainsaws are owned by Chervon, a popular international power tool manufacturer. They have factories in China and Germany and have 20 years in the industry. EGO came to life in 2014 as an energy efficient brand and its success has been the turning point for many battery powered products on the market. EGO’s range of chainsaws at this current point of time is not large, but they only need to get it right once for the brand to catch on. 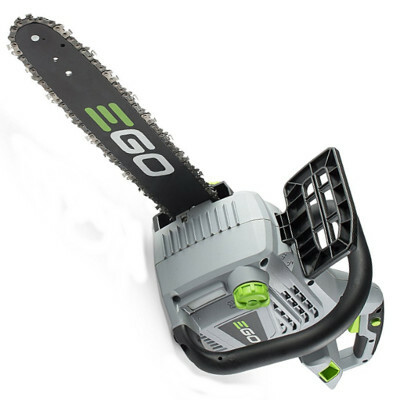 EGO currently produce a Power+ 56V lithium ion 35cm chainsaw and a Power+ 56V lithium ion 40cm chainsaw. Both are currently producing excellent results. EGO saws are more suited towards homeowners, rather than those in need of commercial grade or professional saws. You can also buy many parts and accessories for this brand both online and in store. It has a powerful and high efficiency brushless motor. Its battery can be used in many EGO power tools. It can deliver the same performance as some gas powered chainsaws with comparable specs. It has a chain kickback brake to increase safety in use. It has to be used near a power source – or you need back up batteries. It’s not suitable for commercial grade or professional use. It’s a little on the heavy size in comparison to other chainsaws of similar specs. Dimensions: 25.2 11.8 x 11.8 inches. Warranty: 5 year tool warranty. QDoes it come with a battery and charger? need? AEGO POWER+ 56-Volt 5aH battery. QIs it interchangeable with other EGO power products? Even though it’s on the higher end of the price scale, you do get a lot for your money. This top handle EGO battery powered chainsaw has proven itself as a reliable, problem-free chainsaw with lots of power to give. The battery lasts a very long time in comparison to some other models and brands, and it just keeps going! All components, including the shell, are made of quality materials, and it’s easy to start and run. It’s also packed full of safety features and comes with a battery and charger. This battery can also be used for EGO’s full range of power tools. It’s certainly the best EGO chainsaw for the money. Check out what other people who purchased this product think about it. Read EGO Power+ CS1600 cordless electric chainsaw reviews. It has a powerful brushless motor with 6300 RPM. It’s built to withstand weather elements when in use. The battery and charger is expensive to buy on its own. The chain oiler can sometimes not run effectively. You are limited to where you can use it unless you have spare batteries. Dimensions: 30.1 x 9.4 x 9.8 inches. AEGO POWER+ 56V ARC Lithium battery. If you need reliability in a chainsaw, then that’s exactly what you get with this EGO battery powered chainsaw. For sale at a good price, it’s the perfect addition to any homeowner’s tool shed. It can be expensive to buy the battery and charger, however it’s certainly worth the cost. 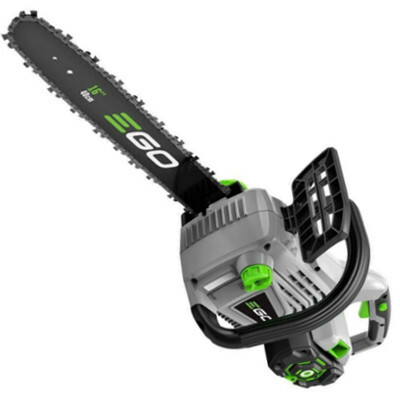 EGO is proving that gas doesn’t always beat battery and that’s clear with its line of chainsaws. It’s easy to see, through its technology, reliability and powerful setup, that this EGO chainsaw is the best EGO chainsaw for the money. Check out what other people who purchased this product think about it. Read EGO Power+ CS1401 cordless electric chainsaw reviews. Not only does EGO provide quality chainsaws, but they also provide quality replacement parts as well. When your bar is damaged or just generally worn, a replacement bar can be quickly and efficiently found. They are for sale both online and in many hardware stores. EGO chainsaws are also produced by Oregon – another leading brand. It’s clear to see you are certainly getting quality when you purchase a bar from EGO. If you are looking specifically for EGO bar, check out this comprehensive guide about available EGO chainsaw bars. However, if you’re looking for a bar in general regardless of the brand, you would love to read this full buying guide on how to select the best chainsaw bar for the money including reviews & comparison. Understanding your need for quality, EGO provides a full range of affordable chains for the products they sell. They’re hardy, durable, cost effective and available to purchase both online and in stores. All EGO chains are manufactured by Oregon, a leading manufacturer of both chainsaws, bars and chains. Whether your chain is broken or just worn down, you are sure to find the correct replacement chain in no time. If you are looking specifically for EGO chain, check out this comprehensive guide about available EGO chainsaw chains. However, if you’re looking for a chain in general regardless of the brand, you would love to read this full buying guide on how to select the best chainsaw chain for the money including reviews & comparison. EGO chainsaws are owned by Chervon, a popular international power tool manufacturer. Where are EGO chainsaws made? Where do you buy EGO chainsaws? Online on websites such as Amazon, as well as retail and hardware stores throughout North America, Europe, New Zealand and Australia.